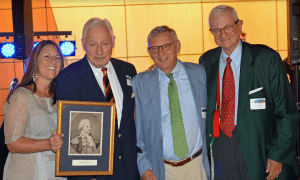 Fort Ticonderoga recently awarded Dr. H. Nicholas Muller III the 2018 Henry Knox Award. 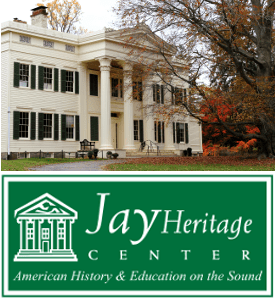 The award was presented at Fort Ticonderoga’s Annual Summer Gala held on August 11, 2018. The award was given in recognition of Dr. Muller’s support and leadership as a Board member on The Fort Ticonderoga Association and his life-long contributions to the field of history. Dr. H. Nicholas Muller was elected to the Board of Trustees of The Fort Ticonderoga Association in 2008. He retired and with his wife Carol moved to Essex, NY in 2002. He has served as the President & CEO of the Frank Lloyd Wright Foundation (Scottsdale, AZ and Spring Green, WI) from 1996 to 2002. Dr. Muller began his profession career as an Instructor at Dartmouth College and at Mt. Allison University (Sackville, NB, Canada). He joined the faculty of the University of Vermont (UVM) in 1966 as an Instructor in the History Department. He became Associate Dean of the College of Arts and Science and a tenured full Professor of History, and with his interest in Vermont’s history he became active in the state, writing many of one governor’s speeches. The head of the Finances for the Vermont Bicentennial Commission, he also worked with John. H. G. Pell on the Champlain-Hudson-Bicentennial Committee. In 1978 he went to Colby-Sawyer College (New London, NH) as President and from there to Madison, WI as Director of the Wisconsin Historical Society, a statewide, multi-faceted state agency with 200 permanent staff. It had a library of 4,000,000 items in North American History. In 1984 he became a Director of Standex International Corp., retiring in 2016. He has published over 60 scholarly articles and a number of books. The Journal of the American Revolution put his 2014 Inventing Ethan Allen on its list of the top 100 books ever published on the American Revolution. 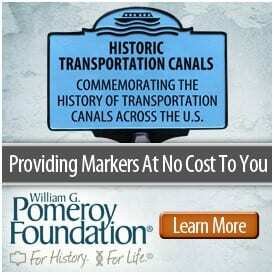 (Fort Ticonderoga Trustee, James Kirby Martin has two books on that list.) He has published more than 150 newspaper columns syndicated in Vermont, New York, Wisconsin, and Virginia. Locally he serves (with Rolly Allen) as a director of the Elizabethtown Community Hospital, the North Country SPCA, an Honorary Trustee of the Vermont Historical Society, and he manages the Essex Community Fund. He continues to write and speak, and a new book The Rebel and the Tory: Ethan Allen, Philip Skene and the Creation of Vermont is set to be published soon. (Fort Ticonderoga has the largest collection of Skene papers in existence.) Dr. Muller earned a BA (with honors) from Dartmouth College (1960), a Ph.D. from the University of Rochester (1968), and Lawrence University (Appleton, WI) gave him an Honorary doctorate (1997). For more information on Fort Ticonderoga, visit their website. Photo: Pictured from left to right: Beth Hill, H. Nicholas Muller, III, Sanford Morhouse, Peter S. Paine, Jr., provided by Fort Ticonderoga.